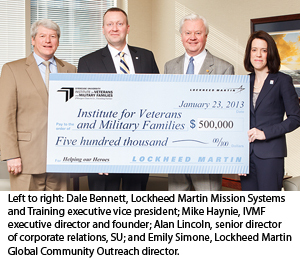 The Institute for Veterans and Military Families at Syracuse University (IVMF) has announced Lockheed Martin as an IVMF One-Star Corporate Partner. The company’s commitment of $500,000 over the next three years will benefit the institute’s hands-on programs, activities and projects focused on helping veterans and military families make the transition to post-service life. The company’s support will assist the growth of existing education and employment programming and seed development of new programs, initiatives and publications positioned to support this deserving population. The IVMF One-Star Corporate Partnership represents a $500,000 commitment over three years. As an IVMF Corporate Partner, Lockheed Martin and the IVMF team will engage on an ongoing basis with the institute’s subject matter experts, research fellows and community of collaborators in support of firm-specific initiatives impacting veterans and family members. For information on partnership opportunities with the IVMF, contact Raymond Toenniessen, IVMF director of new initiatives and external relations, at 315-443-0256 or rmtoenni@syr.edu.